From 20 to 22 of May Masaji Taira sensei lead the 5th seminar of Okinawa gojuryu kenkyukai in France. Participants from around the world such as Lithiania, Belgium, italiy, United States, Venezuela, Spain, Switzerland, Japan, Madagascar attend this seminar. 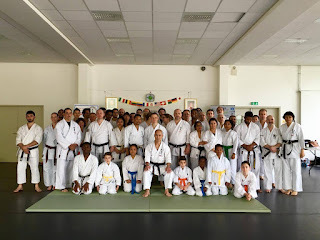 We want to say thanks to Taira sensei as usual because thanks to him, this seminar was technically very rich.... I want to say thanks also to all participants for their support... Big thanks also to my family (my wife and my daughter) for their involvement in this 5th French seminar. Thanks to all my student also because through their solidarity and friendship this seminar was a success in every sense.